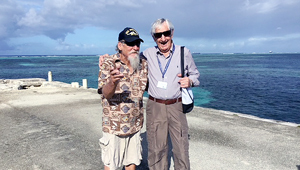 Here is link to an article about Ralph Young’s journey back to the Marianas after 73 years. He is standing on the very location he landed. This entry was posted in Guam NoW, Honor of Vets by Guam Liberation. Bookmark the permalink.